Especially suitable for the repair of deep -seated plug configurations. 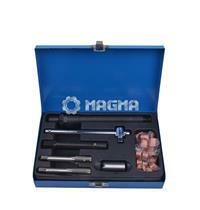 Incorporates taper and plug taps together with integrated ream. Stepped tap ensures correct alignment of cutter in existing spark plug hole. Extension tools allow easy access to the bottom of the plug recess.